Most bodybuilding manuals prescribe about the same movements for training back. You’re supposed to start with deadlifts, move on to chins and barbell rows, then finish your day with some lat pull downs. This primary focus upon free weight movements has served many bodybuilders well over the years, but it has also cost many bodybuilders years off their competitive career due to injury. Additionally, some bodybuilders, because of their training style, body type, or other factors, are unable to attain the pump in their back required for balanced muscle growth. They might get bigger, and they sure get stronger, but they often will lack the ability to attain and maintain a balanced pump which leads to balanced growth. Here are a few movements which trainers can use to attain great bodybuilding back growth without the use of free weights. These exercises often get a bad rap by bodybuilders, because they are often populated with the elderly or soccer moms looking to pump up their bodies by swinging a massive 10 pounds with no feel or control. Yes, the machines are essentially “idiot-proof” and can seem very easy when the weight used is moderate and the reps are high. 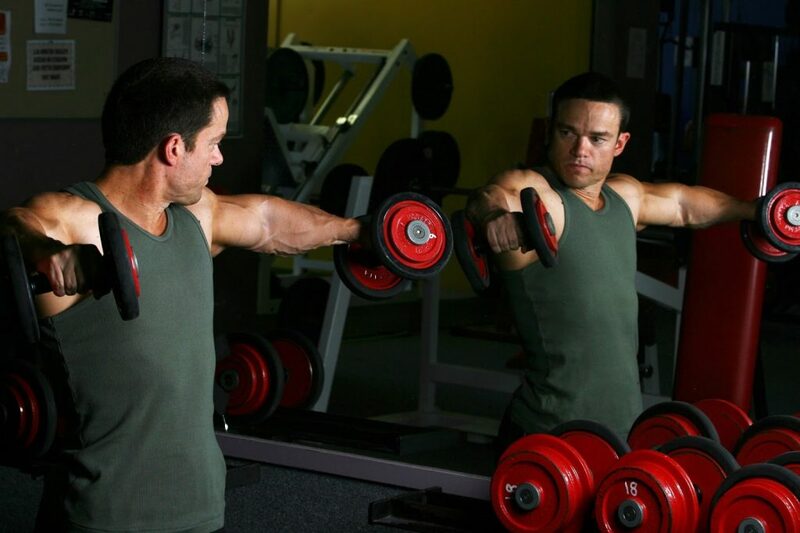 However, by increasing the weight, slowing down your repetition speed, and working hard to feel the contraction of the back with every repetition, you may be able to see better results from these machines than you can with free weights. You don’t have to think about balancing or controlling the weight, so your sole focus should be upon pushing it. Without a doubt, chins are probably the most effective exercise for adding back width and strengthening the entire back. However, because they can be awkward and heavy movements, we often find ourselves recruiting the muscles of the shoulders, back, neck, arms, hips, and others to allow us to raise our bodies. Reducing the weight allows us to move through the chin repetition slower and with great focus upon flexing the muscle of the back. When completed with a slow tempo allowing the bodybuilder to pause and flex at the peak point of each repetition, rowing places perhaps more blood into the muscle groups of the back than any other movement. Seated cable rows with a variety of handle positions allow the bodybuilder to draw bloods into different parts of the back. Start your workout with the seated wide grip variety, and then rotate the handle out every set, or every other set, to move down in range. Practice pausing at different positions in the repetitions. Bring the weight to different spots on your chest. Find ways to stimulate new muscle fibers with new blood, and new muscle growth will be the result. Aside from the increased blood flow and potential for better ‘feel’, the three aforementioned movements are much safer than heavy free weight training. The chances of being injured on machines or rowing are minimal. If your back growth progress has stalled or if you’re nursing injuries, give back pump training a shot!